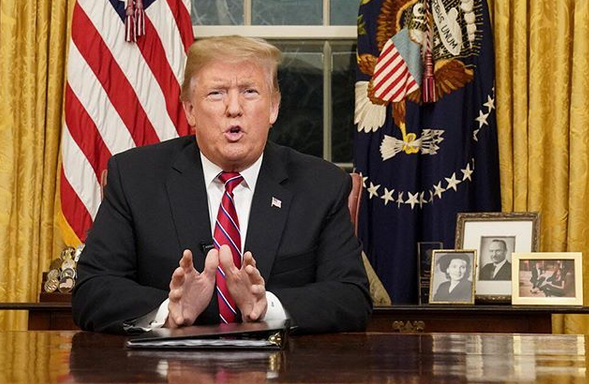 In his first TV address to the nation from the Oval Office, US President Donald Trump demanded funding for his long-promised US-Mexico border wall. In his speech, Trump blamed illegal immigration for what he called a scourge of drugs and violence in the U.S. and framing the debate over the partial government shutdown in stark terms. “This is a choice between right and wrong,” he declared. The US President wants $5.7bn to build a steel barrier, which would deliver on his signature campaign pledge. In the eight-minute address carried live by all the major US television networks, Trump said the federal government remained shut because of the Democrats. Trump said an as-yet-unratified revamp of the North American Free Trade Agreement would pay for the wall. The president also said that 90% of heroin sold in the US came from Mexico. He also pointed out that Democrats have in the past supported a physical barrier. Trump cited cases of American citizens "savagely murdered in cold blood" by undocumented immigrants. “I’ve met with dozens of families whose loved ones were stolen by illegal immigration. I’ve held the hands of the weeping mothers and embraced the grief-stricken fathers. So sad. So terrible,” Trump added. Trump said his intention to build the physical barrier is not out of hatred for Mexicans, but love for his country men and women. "People build walls not because they hate those on the outside. They love the people on the inside," he said. In a brief rebuttal, House Speaker Nancy Pelosi and Senate minority leader Chuck Schumer demanded that Trump end the shutdown. Schumer accused Trump of trying to "govern by temper tantrum". "President Trump has appealed to fear, not facts. Division, not unity," the New York senator said. He concluded: "The symbol of America should be the Statue of Liberty, not a 30-foot wall." Democrats argue that maintenance of existing border fencing, hi-tech tools to scan vehicles crossing at ports of entry, and hiring more personnel would be cheaper and more effective than a wall. 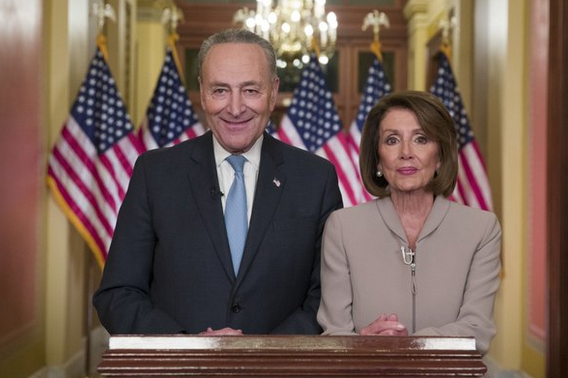 Democrats, who recently took control of the House of Representatives, are adamantly opposed to giving Trump the funds to build the wall. The ongoing closure of a quarter of federal agencies is the second-longest in US history, leaving hundreds of thousands of government workers unpaid. Trump has been discussing the idea of declaring a national emergency to allow him to move forward with the wall without getting congressional approval for the billions he’s requested. But he did not mention that in his address.